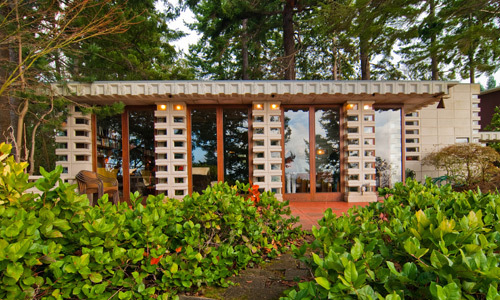 Last weekend we had the rare opportunity to visit one of only 3 Frank Lloyd Wright houses here in Washington State. 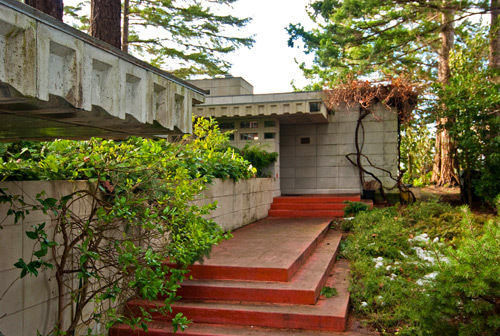 Recently touted as one of Seattle’s 10 Greatest Homes, the Tracy House is a mid-century gem located in Normandy Park (approximately 30 minutes south of Seattle), and it also has the distinct honor of being listed on the National Registry of Historic Places. The house was designed and built for William and Elizabeth Tracy from 1954 to 1955, and they were the sole owners until Elizabeth’s passing a couple years ago. We were extremely honored to see such an exceptional piece of architecture and want to extend our thanks to the organizer, tour guide, and Wright aficionado, Larry Woodin. 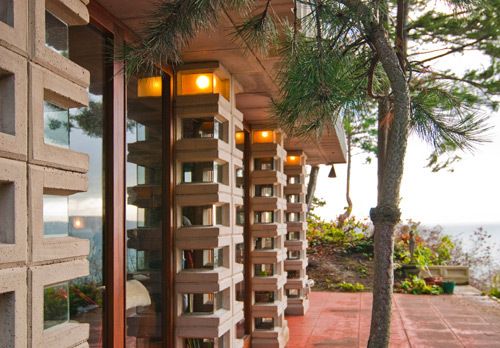 While the tour offered an exclusive look at a private residence designed by, perhaps, the most celebrated of American Architects, there was something more serendipitous that struck us. 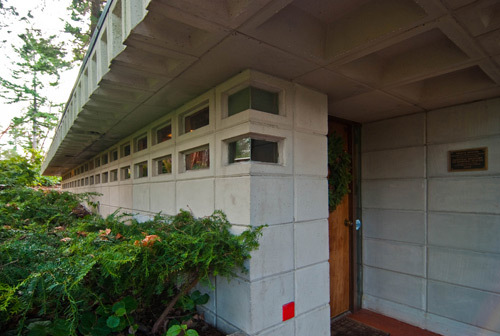 The Tracy house is a remarkable example of Wright’s Usonian Automats – a series of residential designs intended for the middle class. The floor plan is a modest 1,150 square feet which includes 3 simple bedrooms and only the necessary common areas, nothing more. At the same time it seems to have offered the inhabitants a perfectly comfortable life. Architecturally, the house demonstrates so many ideals of good design; all the characteristics that we’re always chattering on about with regard to smarter, smaller dwellings. Psychologically, everything had been thought about –even how the interior shadows from natural daylight would change over the course of a day. As far as sustainability, don’t even get us started; given that this house will easily last 100 years, its carbon footprint is negligible compared to the average modern day “green” home (even with its single pane windows). 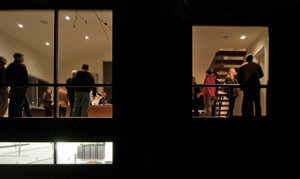 The house embodies a philosophy of design that is now more critical than ever. 1. Everything it needs to be and nothing more: There’s no “bonus room/video game room” or other superfluous space that doesn’t have a primary purpose. 2. Indoor/outdoor spaces: The terrace was designed with the same intention and thoughtfulness as any room inside the home. Given the careful siting and coziness of the terrace, we’re willing to bet that it’s contributed an essential function to the home over the decades. 3. 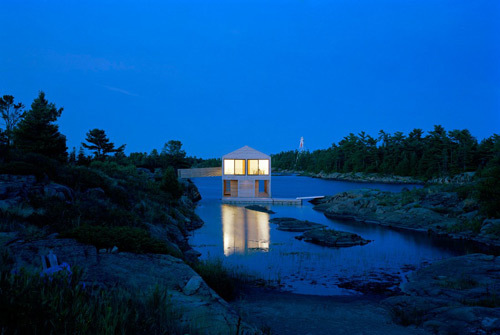 Privacy: The house is nestled comfortably into the landscape with attention paid to neighboring properties. The angle of the home on the property is just right to take advantage of the view and natural light without compromising the sense of privacy from the neighbors. 4. 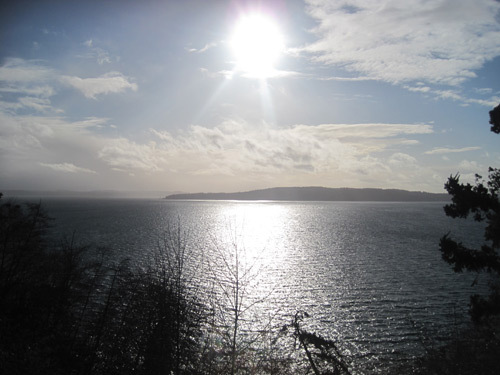 Deliberate views: Sightlines from the home’s common areas offer clear views over the bluff and out onto the Puget Sound. The expansive view balances out the intimate feel of the interiors. 5. Manipulation of spaces: The entry and hallways are deliberately kept low and dark so that the light-filled common areas with their higher ceilings are amplified. 6. Dynamic spaces: Relief within the concrete walls as well as the intentional breaks of the window bays offer light conditions and shadows that constantly change throughout the day. Apparently there’s even a specific location for flowers based on the shadow patterns between dawn and dusk. 7. Bedrooms that are just bedrooms: The bedrooms are simple and straight-forward, maintaining their use as places of sleep and rest, while encouraging The Tracys to use the common areas for up and about activities. 8. Walls of glass: This opens the interiors up to the terrace, the view and an abundance of natural light. 9. Built-in seating: Designed correctly it allows less wasted space in the living room and creates a harmonious feel at the interiors. 10. 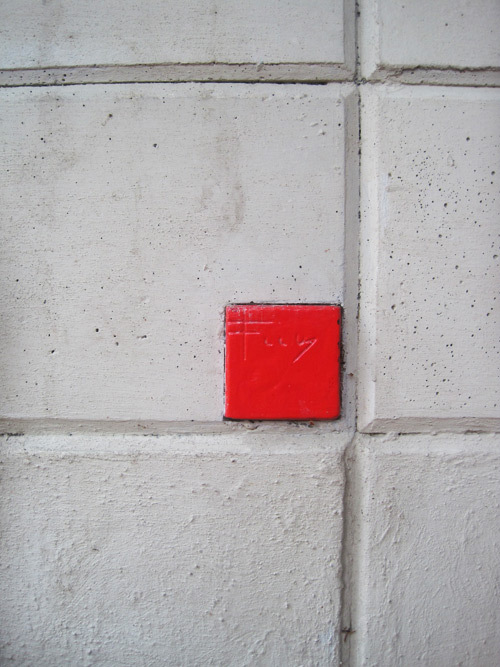 Integrated components: Items like lights and scuppers, that are designed into the structure and the concrete block geometry, don’t necessarily save space but lend a feeling of everything being in the right place. If you made it to this tour let us know what thoughts you came away with. 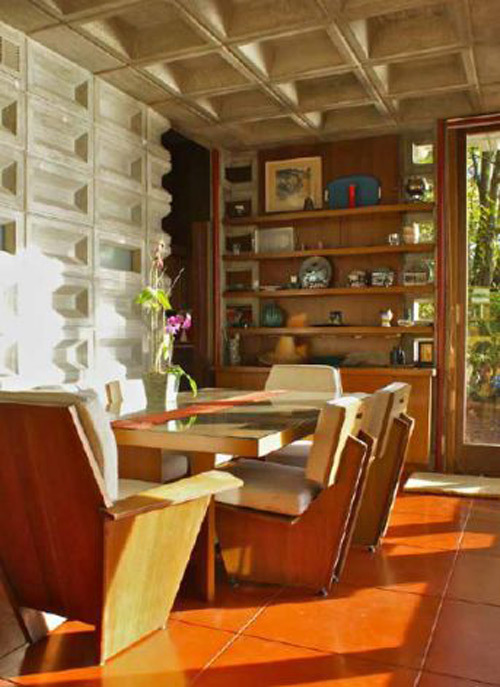 If you missed this one, stay tuned to the BUILDblog, we’ve got the scoop on the next Frank Lloyd Wright house tour. You can check out some additional resources about the house here, here, and here. Big thanks to Larry Woodin at ecohome@mindspring.com. 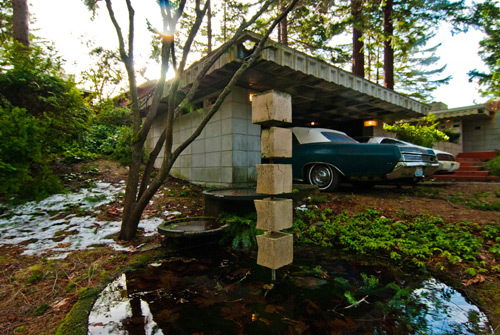 I would never have known that this home even existed in the NW. Thanks for sharing the info and shots; I’ll keep my eyes open for the next tour. Anyway, if you know a number I can call and or historic site that tracks this kinda information I’d appreciate it. And thanks for the info on Olde English Hardwoods, they did a great job restoring and putting in some new oak for us! @Jeremy – you would need to visit the city or county building department and request copies of the original permit drawings for the house. If they exist on file, the architect’s name should be on the drawings. Yet another wonderful post. I’m jealous you got a tour of this elusive building. Thanks for sharing the photos. wow! so many questions, but i’ll limit myself to a few. [custom] concrete blocks doesn’t sound like an an obvious choice for the northwest, but it makes sense especially right next to the ocean. do you guys see this as a very rare thing because of the period in which it was built or just unique for the geographical location in general? 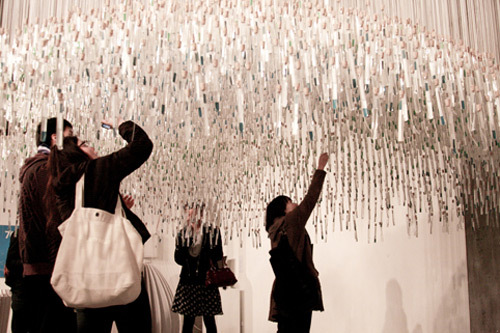 what was your overall take on the choice of materials? the fact that they made all the blocks themselves is truly amazing! also-what were the acoustics like in the living space? it seems like a very “hard” space, but i wonder if the deep ceiling coffers and built-ins helped to soften it up. it sounds like there is some reverb in the videos, but it might just be the old tape. that view is sweet, but i’m curious about the rest of the site. are any neighbors nearby or visible? i thought I saw a chimney and tv antennae below the house in one shot. And the detailing is exquisite. 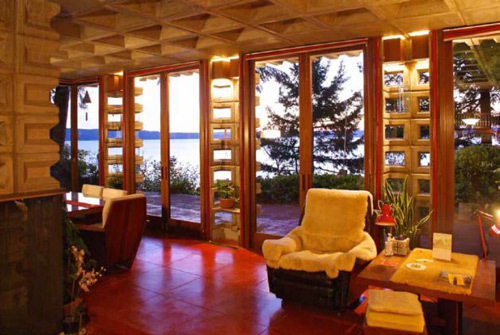 Thanks FLW for so much Architecture and thanks BB for sharing that wonderful piece with us. 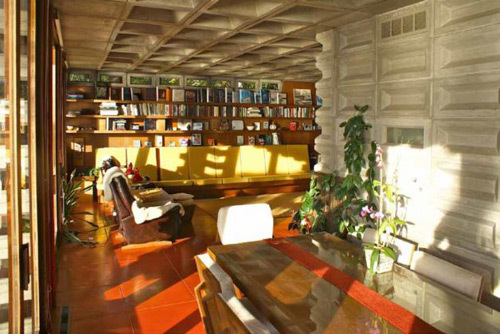 I’ve toured several FLW Usonians – wood, brick, and concrete block – and one thing I’d add to your Top 10 list of successful design concepts is plenty of ‘organic’ materials on the interior. The photos here, and at http://www.thetracyhouse.com, demonstrate this well. On the sustainability front, I don’t share your enthusiasm. Yes, it was built to last. And the ability of this house to meet its residents’ modest needs so beautifully within a small footprint is very instructive … if anyone is willing to listen. 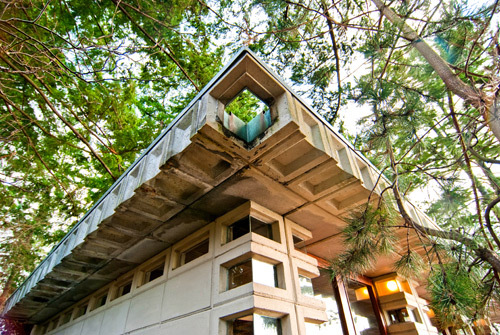 On the other hand, the Usonian Automatics used concrete inside and out, top to bottom – the intent was to save on material and labor costs, but the abundant use of concrete earns minus sustainability points today. This type of construction also makes adapting the structure to changed needs difficult. Add to this the issues of insulation (little), glazing (single-pane glass secured with glue? ), and massive thermal bridging, and we’ve got a case study in how NOT to build an energy efficient envelope. This particular Usonian also has a walk score of 18 out of 100, a good example of Wright’s dispersed, anti-urban ‘Broadacre City’ and its utter dependence on the automobile. So, aside from its ambiguous sustainability lessons, Wright’s Usonian philosophy have much to teach. Thanks for distilling some of those lessons here! See John Sergeant’s excellent book, “Frank Lloyd Wright’s Usonian Houses: Designs for Moderate Cost One-Family Homes” for more info. Wow! This is so nice. Thank you for sharing the photos and giving some information. I’ll look forward to see more of the pics and next posts. It was a pleasure to share this Wright house with people who appreciated it. I will do a “make-up” tour in the near future for those who missed it. And we plan tours of the other TWO local Wright houses soon. Each of these extraordinary in its own way. Other lectures, tours and unique opportunities will soon be announced. 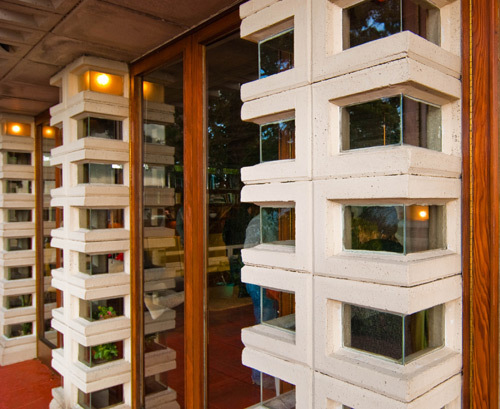 FLW did use a precast concrete custom design block system that had rigid insulation between the outer + inner concrete decorative blocks. 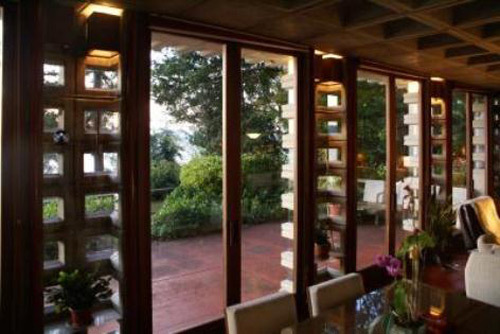 It was the 50’s & single pane glass was commonplace not exclusive to FLW. 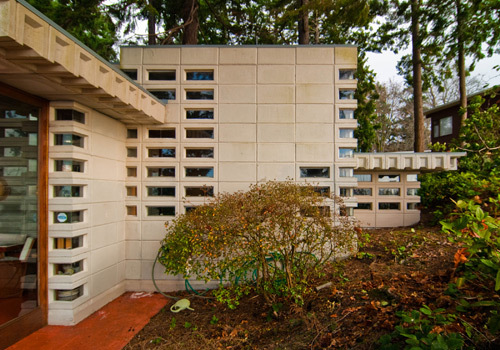 When you buy a FLW house you live with FLW & do not “modify / expand” upon the house as the 360 sculptural qualities of majority of his homes do not lend themselves to DIY handyman expansions.